Libya’s lapse into the chaos of failed statehood has provided a breeding ground for terror and a haven for groups such as ISIS. Its plight is also creating an opening for Republican presidential candidates to question Clinton’s strategic acumen and to undermine her diplomatic credentials, which will be at the center of her pitch that only she has the global experience needed to be president in a turbulent time. Gathering questions over Libya also point to one of the central complications of Clinton’s campaign for the Democratic nomination, due to formally launch on Saturday: the fact that she must own a record at the State Department that lacks clear-cut diplomatic triumphs. She’ll also have to answer for misfires in the Obama administration’s wider foreign policy as GOP candidates who have not faced the same tough choices can nitpick her record with the advantage of hindsight. Libya has long been a vulnerability for Clinton because of the deaths of U.S. ambassador Christopher Stevens and three other Americans in an attack on the Benghazi consular building and a CIA installation on September 11, 2012. But Republicans have yet to prove that she was personally negligent or to convince voters that she’s not fit for higher office because of the controversy. So now they’re opening a new front on the wisdom of the intervention itself. Kentucky Sen. Rand Paul, a GOP presidential candidate, has called Libya a “jihadist wonderland” and Hillary Clinton a “war hawk” in questioning the mission, which he is using to flesh out a wider critique that American military interventions in the Middle East have backfired badly. “Somebody needs to ask Hillary Clinton, was it a good idea to topple Gadhafi in Libya? I think it’s a disaster. Libya is a failed state. Someone ought to pay and Hillary Clinton needs to answer questions about it,” Paul said at an Iowa Republican Party Lincoln Dinner in Des Moines on May 16. Concern over what has become of Libya is not confined to the Republican Party. Though Webb did not criticize Clinton directly, his comments raise the possibility that the issue could surface in the Democratic primary race. So Clinton must be ready to explain why she backed a military operation in a region laced with extremism without effective planning for the aftermath. It’s the kind of question that has long challenged Republicans in the wake of President George W. Bush’s invasion of Iraq. Clinton’s campaign declined to comment for this story, so it is unclear whether what happened in Libya after Gadhafi fell has changed her thinking on military intervention. 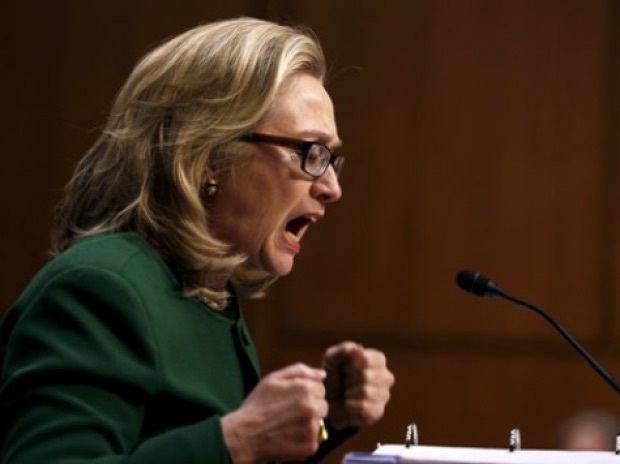 But when she is challenged, she is likely to stress that Obama’s national security aides feared that Gadhafi, who had threatened to hunt down opponents like rats, was poised to unleash a massacre in Benghazi as his forces advanced on rebels crowded in the city in March 2011. It is clear that Clinton and other top administration aides perceived an agonizing dilemma: Should they take action to avert human carnage or stand by and be accused of abetting genocide? Clinton might have been thinking about the recriminations that flew when her husband Bill Clinton’s administration failed to thwart a genocide in Rwanda in 1994. The former president has since said his decision not to intervene was one of his biggest regrets. Initially, the operation was billed as a purely humanitarian effort to create a no-fly zone to thwart Gadhafi’s forces, which was endorsed by a U.N. Security Council resolution. But air attacks on Libyan forces designed to make the skies safe for Western aircraft helped tip the balance of the battlefield toward the rebels and left critics of the war, such as Russia, convinced that an international coalition under the umbrella of NATO had always been bent on regime change. In the end, Gadhafi was indeed toppled, capping a four-decades-long legacy steeped in blood, including violent repression at home and accusations that he was behind the bombing of a U.S. airliner over Lockerbie, Scotland, in 1988. Initially, the Libya intervention seemed set to go down as one of the Obama administration’s triumphs. “We came, we saw, he died,” Clinton joked with a television reporter in the wake of the death of the fugitive Gadhafi at the hands of a mob, days after she visited Tripoli in support of Libya’s transitional government. But when Gadhafi fell, he left a land of eviscerated political institutions ill-prepared for its sudden freedom. Torn by tribalism, ruled by two rival parliaments and with hundreds of civilians killed during the subsequent civil war, Libya is suffering a complete breakdown of political authority, which has spurred the rise of a host of terror groups. The unrest has also spawned a huge refugee crisis as desperate migrants flee across the Mediterranean on overcrowded boats. And where chaos and anarchy rein, terror groups often see opportunity. ISIS is seeking to expand its franchise in Libya and to grab a foothold from which it could export terror across the Mediterranean to Europe. The surf literally ran with blood earlier this year when ISIS beheaded 21 Egyptian Christians in a show of brutality on a Libyan beach. For Clinton’s part, she seemed to indicate in her book “Hard Choices” that she knew all along that Libya would face a tough road. “I was worried that the challenges ahead would prove overwhelming for even the most well-meaning transitional leaders,” Clinton wrote. “If the new government could consolidate its authority, provide security, use oil revenues to rebuild, disarm the militias, and keep extremists out, then Libya would have a fighting chance at building a stable democracy. Clinton has little choice but to own what happened in Libya. An email to Clinton in April 2012 from her former top adviser Jake Sullivan, released last month, appears to show that initially her aides were keen to trumpet her role in the intervention and saw it as legacy-enhancing. “HRC has been a critical voice on Libya in administration deliberations, at NATO, and in contact group meetings — as well as the public face of the U.S. effort in Libya. She was instrumental in securing the authorization, building the coalition, and tightening the noose around Qadhafi and his regime,” Sullivan wrote. Former Defense Secretary Robert Gates also describes her pivotal role in the decision making in his memoir. Gates said the intervention, which he initially opposed, split the administration down the middle, with heavy hitters such as Vice President Joe Biden and national security adviser Tom Donilon also against. On the other side were U.N. Ambassador Susan Rice and National Security Council staffers including Ben Rhodes and Samantha Power. “In the final phase of the internal debate, Hillary threw her considerable clout behind Rice, Rhodes and Power,” Gates wrote. Clinton’s prominent role in the decision making on Libya was a political risk at the time, and it now threatens to return to haunt her four years on. “We haven’t gotten the full story yet, but from everything we do know, it appears that without her advocacy for this intervention, it wouldn’t have happened,” said Alan Kuperman of the Lyndon B. Johnson school of Public Affairs at the University of Texas, who has studied the causes and outcome of the Libya operation. Some critics now question whether the administration, presumably working from intelligence provided by rebels, miscalculated on Gadhafi’s intentions. And they say that the administration did not do enough to consider the consequences of an operation that ended up toppling Gadhafi. But one U.S. official involved with the planning of the Libya engagement defended Clinton’s position. “I think that it is tempting always in hindsight to say Libya would be better somehow if we had not intervened,” said Derek Chollet, a close national security adviser to Clinton and Obama at the time of the Libya operation. But it is always hard in political campaigns to prove that but for a specific course of action, things could have turned out worse than they actually did. And Clinton’s opponents, especially Republicans who want to dismantle her credentials as a potential commander in chief, are already signaling that Libya will be a significant political battleground in 2016.